Winter Hall is in the final of Developing Beyond 2017. We did it! July came around quickly and so too did the Develop conference in Brighton. Rob bought a delegate pass but interest in Winter Hall was such that he didn’t see a single talk. This was a good sign. The judging panel played, scrutinised, questioned and deliberated and then it was the moment of truth (captured in all its glory at 1:12, below). We are delighted but also determined to make the most of this amazing opportunity. Watch this space. 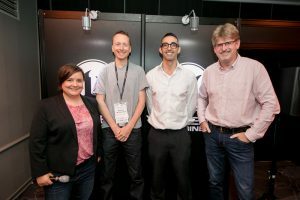 Rob, pictured with Developing Beyond judges – comedian and broadcaster Susan Calman, Iain Dodgeon of Wellcome and Mike Gamble of Epic Games.